We are being contacted by media regarding the selective editing of footage from the 2007 television series, Enemies of Reason. I feel that the complete unedited interview clearly makes me a friend of reason, not its enemy. The free speech issue with TED continues. We're receiving inquiries about why the current TED post of my rebuttal to Richard Dawkins is disparaged by the website while all additional comments are being blocked. I reposted the video on my YouTube channel and have received over 12,000 views (with several positive comments). We believe that this controversy will not die down, since it addresses major issues over selective, distorted editing by the Dawkins group. Behind the scenes it is self-evident that TED isn't unbiased but actively promotes militant atheism as scientifically valid. If so, isn't a healthy public debate in everyone's best interest? As a defender of atheism, Richard Dawkins has publicly declared that religion is the "root of all evil," which became the title of his first big television hit in the UK, broadcast in 2006. Its follow-up, in 2007, allowed me to meet him in person. He invited me to answer a few questions on camera, and I did. The resulting video footage has just emerged -- leaked by an unknown source -- and can be viewed on YouTube. Our Q-and-A wouldn't be exceptional in any way except for the use that Dawkins made of it. I became a lurid example of the "enemies of reason" that his new show was attacking. To squeeze me into that box, Dawkins did some very unreasonable things. We were standing in a courtyard in Oxford, politely dressed and just as politely talking. I'll give a few excerpts of what we said. Dawkins began by referring to the title of a book I wrote on mind-body medicine. Richard Dawkins: Could you explain your revolutionary ideas on quantum healing and any evidence there may be that it works? Dawkins: But where did the quantum theory come into that? Chopra: Oh, it's just a metaphor. Just like an electron or a photon is an indivisible unit of information and energy, a thought is an indivisible unit of consciousness. Dawkins: Oh, so it's a metaphor for a unit. It has nothing to do with quantum theory as in physics? Chopra: No, I think quantum theory has a lot of things to say about the observer effect, about non-locality, about correlations. So I think there's a school of physicists who believe that consciousness has to be equated, or at least brought into the equation, in understanding quantum mechanics. This doesn't sound like somebody hanging somebody else out to dry. The full interview took about 15 minutes, and I wasn't naïve enough to believe that Dawkins would portray my views in a favorable light. But seeing the footage again, I don't find that a single answer I gave qualifies me as an enemy of reason. I talked about how a person's state of awareness affects the body's homeostasis and its healing response. I spoke about spiritual experience as a means to overcome fear of death. At the same time, Dawkins took the position that quantum physics shouldn't be brought into these topics, and I admitted (how could I not?) that there was controversy. In the end, my remarks were cut down to a fraction of what I said, which is normal television practice. The scientists who were exploring consciousness that I mentioned as support were excised. Dawkins introduces me in voiceover as someone "who once qualified as a doctor." (Despite the implication that I lost my credentials, I was then and remain a board-certified endocrinologist.) To trivialize me, Dawkins says, "In this year of self-absorption, he claims Michael Jackson, Madonna, and Hillary Clinton as followers." I never made such a claim; Dawkins takes his facts from National Enquirer journalism. "Followers" adds the whiff of cultism, of course. "Reason and a respect for evidence are the source of our progress," Dawkins declares as the major theme of the series, but Enemies of Reason is actually a stalking horse for his contention that the world is divided into two camps: the people who follow science, and the people who don't. All the latter are irrational in various dire ways, ranging from ignorance and superstition to pseudoscience and charlatanism. Since I'm not religious, clearly I belonged in the second camp of bogus thinking. 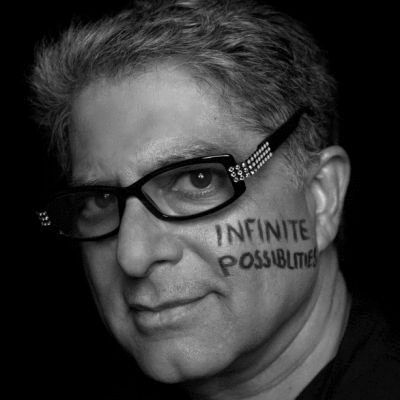 "Isn't Deepak Chopra simply exploiting quantum jargon as plausible-sounding hocus-pocus?" Dawkins asks. Well, no. Not if you actually read what I write, which includes books and articles co-authored by physicists. I doubt that his other interviewees are treated any more fairly. To shoehorn me into his category of the dangerously bogus, Dawkins was thoroughly dishonest himself, ignoring my call for an expanded science that would include consciousness, my backing of peer-reviewed research, my partnership with highly accredited scientists, and so on. Why air a 6-year-old grievance? Because what I talk about on the actual video is pro-science and pro-consciousness at the same time. Dawkins seems totally ignorant of any aspect of quantum physics or consciousness research. His animus against organized religion, which he is perfectly entitled to, has led him into zealotry. It is preposterous to label God the root of all evil and intellectually dishonest to lump all thinkers who don't accept his own cut-and-dried materialism as "fundamentalists and those who profit from obscuring the truth," but Dawkins' popularity is essentially grounded on both. "We live in dangerous times when superstition is gaining ground and science is under attack," Dawkins tells the camera, blatantly riding the cresting fear that overcame the public after 9/11. It's discreditable to connect all religious belief with dangerous unreason. I certainly didn't see myself in such a portrayal. Here comes a hay wain, trundling out of the Middle Ages, and apparently I've booked passage with dousers, clairvoyants, stage magicians, promoters of false miracles, and the poor simple souls who fall for such nonsense. The Enemies of Reason (which can be viewed on YouTube) is just old TV on the one hand, a successful episode in Dawkins' rise as the most celebrated of militant atheists. On the other hand, mind-body medicine has matured and expanded, and so have far-seeing theories of how to fit consciousness into our conception of the universe. Dawkins will one day be relegated to a footnote in the rearguard action to defend narrow-mindedness as science. To attack God, he felt obliged to play God in the editing room. Distortion and misrepresentation are consistent with the ridicule and contempt that militant atheism traffics in. Happily, the surge of people Dawkins anticipated fleeing God to leap into his arms hasn't occurred, while a reconciliation between science and faith has been progressing toward a better future for both sides. Dawkins' attempt to make "spirit" a dirty word was doomed from the start.